Interview by Margaret Cooper in 2000 for the “Oxton Now & Then” production. Kath Allwood (deceased), widow, lives at Fernlea, Main Street, Oxton. “I came to Beanford Farm, Oxton when I was five. I can remember my mother used to bring me down on the back of her bicycle to school and also I can remember in 1926 the colliery strike and the men from Blidworth used to come past the farm and look over the fence at the chickens and my dad used to stand there watching them in case they grabbed one. My grandparents lived in Orchard House and I used to go there at lunchtime and then mum fetched me at night”. “[There was] very little traffic. I don’t know what year it would be, but when Barton’s Buses started to run they kept the bus under the shed in Home Farm and started up from there. We used to walk to Arnold. There was very little way of getting out, if we wanted anything from Arnold, Marsden’s used to put things on the bus for people and meet the bus”. “Doctor West from Epperstone used to cycle to begin with, but then he did have a little car, I believe, later on, and of course we had Nurse Knight [who] lived in the village, she was the Midwife. The Police house was Quince Cottage [as] they call it now. I should be about twelve when I can remember that being the Police House before it moved; it would then be on Main Street”. “I left school on the Friday and started to work at Calverton Factory on the Monday for seven and six a week. [I worked from] eight o’clock till six I was on silk stockings actually, they called it running-on. The frames of course made the stockings and then we picked up the threads and then they went back on to another machine to make the feet of the stockings. [In] part of the factory they made underwear as well, but I wasn’t in that department. There was very few from Oxton, there was quite a lot of girls used to bike up from Blidworth. I believe Louise Smith was there a while. Then I left and went to Meridian when I was about seventeen. Money was a little bit better. When I was on shifts [I] used to bike and I used to have to leave here about five, it was six till two and two till ten. Mum used to meet me near the sheep wash because I didn’t like coming through the woods”. 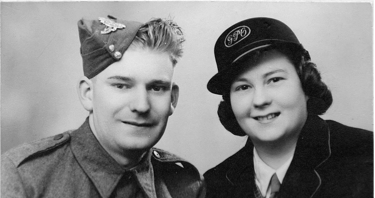 “[Gordon, my husband to be] was an apprentice bricklayer at Mr Nix’s. They were building air-raid shelters, something to do with the war effort because he was deferred for a while, and they used to stay [in Lincolnshire] the whole of the week and come home at the weekends. So [my friend and I] both sent Valentine cards [to Gordon and] the boy that she was sweet on. Gordon kept his and carried it all through the war and I’ve still got mine”. “I should be eighteen [when I got engaged]. [My father] was a good father, but he was a bit strict regarding boyfriends, I had to do it on the quiet. [We got married during the War]. [I] still had a wedding dress and a veil and I never did know where my wedding cake came from, but I got a wedding cake. We had the reception in the Village Institute”. “When [Gordon] was first called up he went straight down to Paignton. He was in the Artillery and after he’d done his training he was on the heavy guns, the coast guns. After it finished over here, they were shipped out to India because they were going up the Burma Road, but luckily it finished before they started off. I’m sure it was 1947 before he was home. Terry [born in 1944] of course saw very little of his father. “Previous to Terry being born, when I lived in Bridge Cottage, [I] had the Lumber Jills as they call them, that worked in Epperstone Park. They were girls, recruited from munitions. They were from Sheffield. I kept in touch with one of them for a long while. While she was with me she married a Captain in the Army and he used to come and stay”. “When Gordon returned from the War] he went back to Nix’s for a time and then he went to work at Southwell on the Leaway bungalows. It was a huge firm, really was”. “[I was involved in] the youth club, Pioneers. There was a committee of us and between us we ran it quite a long time. [The club met] In the Memorial Hall, yes, the Memorial Hall was built then. When they were building the Memorial Hall, the Sunday School laid a brick with their initials in”. “Ethel Turner used to come round the village [delivering milk] with a bucket and a ladle and I used to go where she used to deliver, take it down to Mrs Adams at Elmfield and I used to go with her when I was young quite often. I’ve just given my half-pint ladle that I had from my grandfather’s farm to the museum at Calverton. [He had a herd of cows at Beanford Farm]. Ron Smith collected the milk churns from the farms and took it to the dairies somewhere and they also had coal delivered, of course it was all coal fires them days”. “We moved in [to Fernlea on] 5th August 1950. There was four [houses] ready and we got one of them. The whole of Elmcroft was a meadow”. “[Gordon] decided to set up in building. Unfortunately Terry had only been with his dad a year when he died. 1965 he died”. “Mrs Severn had the Post Office [during the War] and I [delivered post to] all the top end of the village , [and] the outlying farms. I used to cycle round about eight mile radius on to Ollerton Road, there was one farm on Ollerton Road, used to go to what is now the Golf Course, Forest Farm as was, and then to the Grange and Moorfield. If there was any letters for Pudding Bag, [I] used to go to that as well, and across the fields to the Fallows. Imagine them doing that on a bicycle now, all weathers. We used to sort the mail then as well. I was the first to have [the] uniform in the village. I loved it and it kept me as fit as could be. I think Mrs Smith took over when I left to have Terry”. “The children had to walk [to the village school] from Moorfield and the Grange. We had a lot of children from the cottages [there]. Yes they all had to walk, there was no way of getting. It was only an ordinary village road then. I did school meals along with Mrs Les Barmby for quite a while. They used to deliver them from Bilsthorpe in containers”. “There used to be big allotments up the village before you get to Blue Haze, that field was all allotments. My father had one and all the village men. When I went to school, where the school garden bungalows are, the school lads had the allotments. Mr Grover used to bring them down and they grew stuff there, but that was before the war. That’s why it’s called School Gardens”. “I can remember the old Green Dragon. They pulled it down, the only original part is the front of the lounge. It was all tumbled down you know, ever such a low place at the back and really an old country pub. You went in and there was the snug, a little room and panelling all round. The Co- op bought it and then we had the restaurant upstairs, really it was gorgeous up there”. “I can remember one particular Easter we had a party at the Hall and they hid Easter eggs all in the gardens and all over the place, amongst the shrubs and flowers and what you found you kept. They had laundry maids, ever such a big staff there was. When Terry was, well I don’t know how old he’d be, but he got a thing about fishing and Lord Charles Cavendish Bentinck used to let him go fishing in the lake when he was quite small. I used to be petrified he’d fall in”.